supports the respiratory system. 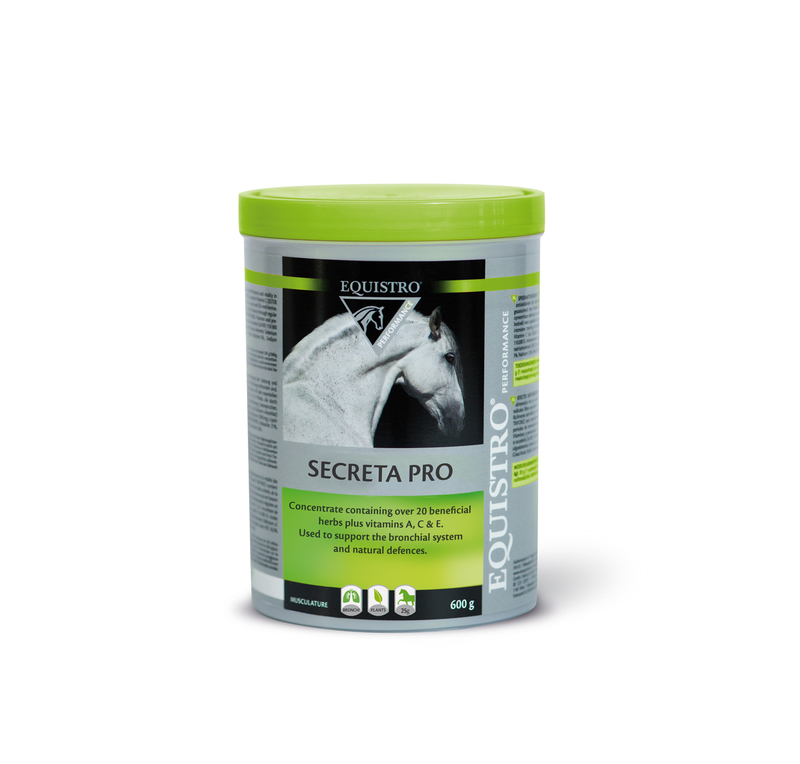 Secreta Pro-Max is particularly recommended for horses requiring a clear airway and healthy respiratory system to optimise their well-being and performance. This is a complementary feed. COMPOSITION: Black horehound (ballotta nigra) 13.6%, Thyme 13.6%, Barley flour 12.6%, Burdock 8.2%, Grindelia 8.2%, Liquorice 8.2%, Carob pod 6.8%, Climbing ivy (hedera helix) 5.5%, Coltsfoot 5.5%, Mullein flowers (verbascum thapsiforme) 5.5%, Lucerne flour 4%, Pregelatinized potato starch 0.9%. ADDITIVES/KG: Vitamins and pro-vitamins: Vitamin E/all-rac-alpha-tocopheryl acetate (3a700) 21800 IU. Aromatic substances: Grape extract 13630 mg. ANALYTICAL CONSTITUENTS: Crude fibre 19%, Crude ash 10.2%, Crude protein 9%, Starch 9%, Moisture 5%, Ash insoluble in HCl 4.3%, Crude fat 4%, Sodium 0.2%. • Horses (500 kg): 10 to 20 g (1 to 2 scoops) per day. • Foals/ ponies: 5 to 10 g (½ to 1 scoop) per day. During the first 7 days, the above quantities should be doubled. 1 scoop = 10 g.
Megabase junior contains vitamin and mineral support to help the normal development of foals. Flexadin UCII contains UCII for optimal joint health and mobility in horses. Respadril contains 6 selected herbs and readily assimilated copper for short term respiratory system support.